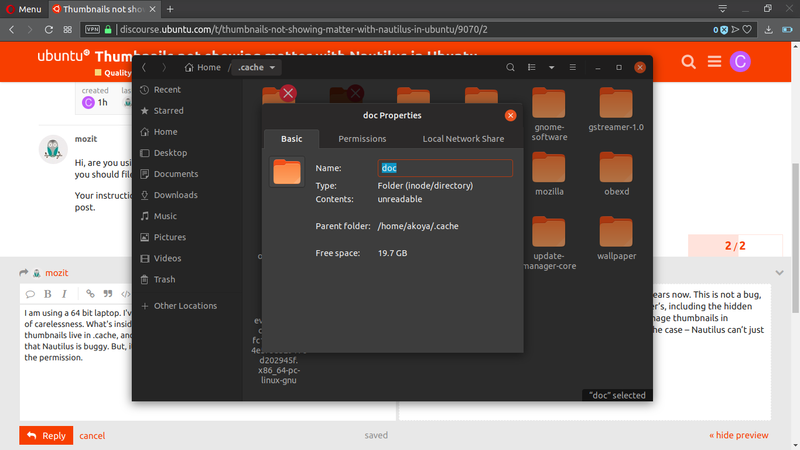 One of the problems Ubuntu users get at first after installation, is that they don’t see thumbnails in Nautilus – you can’t see your photos, videos or such like. This happens, because the .cache/thumbnails is still owned by root. The ownership is not transfered to USER while installing. This has to be done manually after installing Ubuntu. If the release team members come here, they should make a note to rectify this. Nothing in the user’s home folder should be owned by root, even though the user’s home folder (username folder) is owned by root. Hi, are you using 32bit machine? if you do, there is a known issue that is going to be fixed soon. if it’s 64bit you should file a bug report about it. Your instructions for solution might cause more damage then good. Just recommending you to edit your post. I am using a 64 bit laptop. I’ve not had a 32 bit computer for years now. This is not a bug, but a bit of carelessness. What’s inside the user’s folder is user’s, including the hidden files. Your thumbnails live in .cache, and if you can’t see the image thumbnails in ~/Pictures, you consider that Nautilus is buggy. But, it is not the case – Nautilus can’t just open/read them, for it doesn’t have the permission. And, there’s nothing there in that folder by the way, strangely. The thumbnails should not have to be blocked, from the beginning. Just file a bug, will you?